Choosing a colour scheme will focus your planning and coordinate the overall look of your haunting Halloween party. We selected black, green and orange for all the decorations and tableware for our party. We were very fortunate to have a fabulous black fireplace as the backdrop for our party table. Choose a setting that can be decorated as a mise en scene for your focal point – the party food table. No Halloween party would be complete without a pumpkin or two. Our selection of pumpkins were carved with different patterns and designs, and set on the fireplace to create a stunning backdrop. 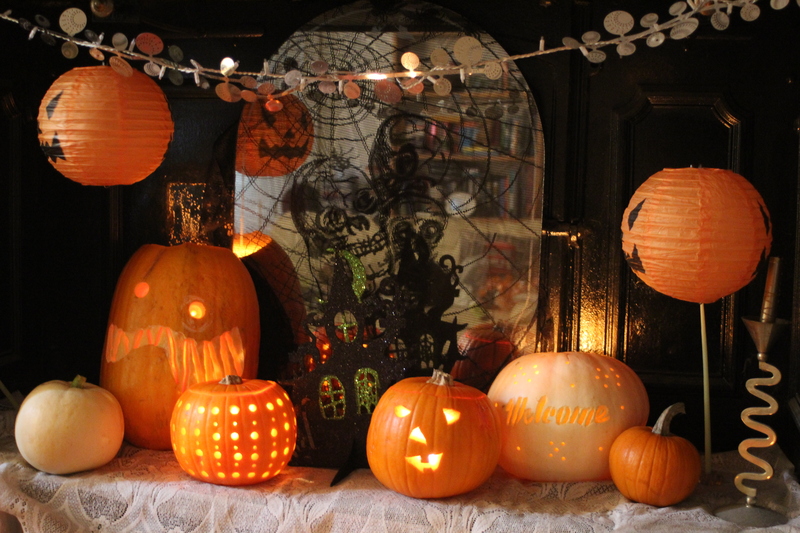 A skeleton design lace tablecloth was draped over the a mirror in the fireplace, which really sets off the pumpkins. We hung paper pumpkins from the top of the fireplace to create some height to the display and wound a pumpkin light garland around our pumpkins. Choose a tablecloth and tableware to match your colour scheme. Add interest to your display by varying the height of your food platters. A cake stand and freestanding table decorations are great for creating a high-level visual focus. We used our own black tableware, and orange tablecloth. 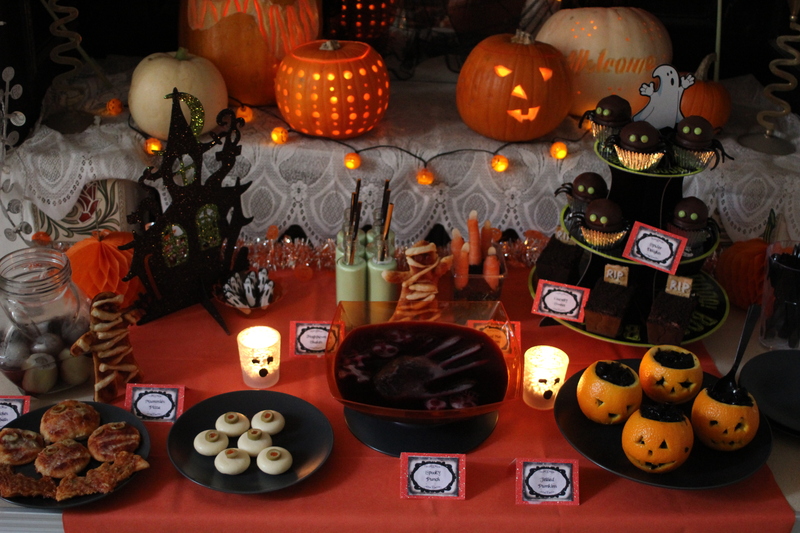 Small dishes of chocolate treats, and ghostly tea light holders, all add fun to the table. Extra decorations do not need to be expensive – you can make your own, or pick up items very cheaply, if you know where to look. We used a selection of inexpensive decorations from Poundland to decorate our table. Part of the fun of Halloween is the spine-chilling food ideas. Kids will delight in eating ‘Newt Eyes’ or ‘Frogspawn Shakes’, and grown-ups can let their imaginations run to create the weird and wonderful. Use labels for your food to describe your hair-raising creations. We used free printables from Lil Luna. ← Halloween Recipes – Dead Man Fingers!